Many investors wish they could buy the hot IPO. An IPO is an initial public offering. It’s the day when a stock begins trading. Many stocks deliver big gains on that day and individual investors often wish they could have benefited from that first day gain. But, the sad truth is that most individual investors will not be able to benefit from the big gains associated with an IPO. That’s because the gains go to big investors who received shares before trading began. The IPO consists of a limited number of shares and the brokers handling the offering will decide how those initial shares are allocated. The process is designed to ensure the stock will trade easily. So, brokers will ask their largest customers how many shares they would like. If you are not a large customer, trading enough shares to generate commissions totaling thousands of dollars a month, you probably won’t be asked how many shares you would like. IPOs are often considered a reward for the broker’s best customers. Stitch Fix, Inc. (Nasdaq: SFIX) recently began trading and the stock more than doubled after the IPO. Early investors were able to book large profits before selling set in after the company’s first earnings report prompted a selloff. Stitch Fix is an online styling service that delivers a personalized shopping experience. Customers start by completing a Style Profile and then a personal stylist will hand pick pieces to fit their tastes, needs and budget. Style boxes are then shipped to the customer. Each box contains five items of clothing, shoes and accessories for customers to try on at home. They keep what they like and send the rest back in a prepaid USPS envelope. Shipping and returns are free. The company also reports that the average price point is $55 per item. That means the complete shipment would cost an average of $275 but there is a 25% discount off purchases when the customer accepts all five items. This year the company is expected to report sales of more than $1.2 billion with $1.4 in sales expected next year. Earnings per share (EPS) are expected to be $0.25 this year and $0.11 next year as the company grows. As the chart above shows, shares of Stitch Fix have been volatile, a week after they tumbled following its first quarterly report as a public company. The stock suffered a 10% plunge on December 19, when the company reported revenue and earnings that slightly surpassed analysts’ expectations but gross margins that declined nearly 3%. Stitch Fix did register earnings of $0.04 per share on revenue of $296 million, beating analysts’ estimates for EPS of $0.03 and revenue of $295 million. The company also said active users increased 30%, to 2.4 million, from the same quarter a year earlier. The sell off was triggered by comments from company executives noting they expected profit margins to continue to be squeezed as it makes investments into new categories. The subsequent recovery came from bargain hunting and the decline has now resumed. Given the low earnings expectations, it is possible the stock is ahead of the fundamentals. This would indicate traders should expect short term weakness in the stock. To benefit from weakness, an investor could buy put options. But, high prices on put options suggests an alternative trading strategy. The option premium is high because the expected volatility of the stock is high. Options that are based on selling an option can benefit from high volatility. For SFIX, we have a number of options available. Short term options allow us to trade frequently and potentially expand our account size quickly. Short term trades also reduce risk to some degree since there is less time for a news event to surprise traders. In this case, we could sell a February 16 $25 call for about $1.90 and buy a February 16 $26 call for about $1.10. This trade generates a credit of $0.80, which is the difference in the amount of premium for the call that is sold and the call. Since each contract covers 100 shares, opening this position results in immediate income of $80. 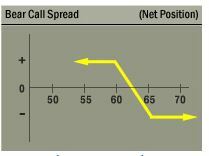 The credit received when the trade is opened, $80 in this case, is also the maximum potential profit on the trade. The maximum risk on the trade is about $20. The risk is found by subtracting the difference in the strike prices ($100 or $1.00 times 100 since each contract covers 100 shares) and then subtracting the premium received ($80). This trade offers a return of 300% of the amount risked for a holding period that is about one month. This is a significant return on the amount of money at risk. This trade delivers the maximum gain if SFIX is below $25 when the options expire, a likely event given the stock’s trend. Call spreads can be used to generate high returns on small amounts of capital several times a year, offering larger percentage gains for small investors willing to accept the risks of this strategy. Those risks, in dollar terms, are relatively small, about $20 for this trade in SFIX.